This past week, The New York Times had a fascinating feature article on the Science of Skating. The article focused on the program at the University of Delaware in which scientists are tracking the motions and movements of figure skaters with goals of improving performance while attempting to also minimize injuries from improper training, overtraining, etc. The NYTimes also featured an article on a skate sharpener in Connecticut named "George," who sharpens skating blades with precision and knowledge of the skaters' skills and level of skating. Some of you may be aware of the President of the University of Delaware, Dr. Patrick Harker, who was the former Dean of the Wharton School at the University of Pennsylvania and is well-known in the operations research and management science communities. My figure skating skills are non-existent, but as the mother of a figure skater, I have been introduced to this magnificent, unique world of artistry, musicality, and intense athleticism. Plus, figure skating combines costumes, drama, competitions, training, and incredible discipline on the part of the skaters (and their coaches). Skating has opened up new friendships, taken us to places we may not have otherwise traveled to (such as Broadmoor and the Olympic training facilities in Colorado Springs and Lake Placid). We have also watched numerous ice shows from Harvard University's to our Amherst Skating Club's annual show at both the Amherst College rink arena and at the Mullins Center at UMass Amherst. Plus, we have had a chance to meet such Olympians as Sarah Hughes and Johnny Weir, whose kindness to the young skaters will always be treasured. I wanted to take a moment to thank the coaches who have through their hard work and expert coaching steered the skaters in their individual directions to strive for their dreams. From skating coaches, to dance coaches, to off-ice coaches, and to all the volunteers who run the various skating clubs, I give a big Thank You! This certainly has been an interesting week! I am serving on two scientific prize committees. The first competition is the 2009 Mathematics Competition for Young Mathematicians in Ukraine sponsored by the Shevchenko Scientific Society of America and the U.S.-Ukraine Foundation with a prize of $6,000US. This is the second year that this competition is taking place and I also served on last year's award committee. This week, as part of the reviewing process, I read over a dozen nomination packets and evaluated the scientific papers forwarded by the nominees, their curriculum vitae, plus letters by outside examiners who commented on the publications and overall reputations of the nominees. If English was the only language that I could read, I would have been unable to appropriately evaluate the submitted materials and to rank the top candidates for the award. The years of learning both Ukrainian (my first language) and Russian (I have a degree in Russian from Brown U. plus three degrees in Applied Mathematics) paid off! As for English, that is my second language, which I began studying in kindergarten a while ago. During this competition I read mathematics papers in all three languages plus nomination and review letters in those languages. Mathematics is its own beautiful and elegant language so I certainly put my degrees and expertise to great use this week. The competition is now in its second round and we hope to announce the recipient of this award soon. To see the caliber of research and publications being done by young mathematicians in Ukraine, a country of 46 million people, which continues to struggle after its independence, was very inspiring! In addition, I am serving as the Chair of the WORMS (Women in Operations Research and the Management Sciences) Award of INFORMS. The deadline for nominations is July 1, 2009. This award celebrates and recognizes a person who has contributed significantly to the advancement and recognition of women in the field of Operations Research and the Management Sciences.It is an honor to be serving as the chair of this committee. The shocking and untimely death of Michael Jackson yesterday at age 50 invoked memories of the death of my dissertation advisor at Brown University, Dr. Stella Dafermos, who was truly a leader in her fields of operations research and transportation science and who died just shy of her 50th birthday. The former spoke in his language of music and the latter in her language of applied mathematics and operations research. They left lasting legacies, respectively, in music and scholarly publications. Directing the Virtual Center for Supernetworks requires the production and dissemination of The Supernetwork Sentinel newsletter three times a year. We are pleased to announce that the Summer 2009 edition is now online (in pdf format). This newsletter contains an essay on highlights of recent presentations from Vienna to Rome, provides information on the just-published book, Fragile Networks, reflects on the World Science Festival in NYC, recalls the amazing speakers that visited the Isenberg School and UMass Amherst as part of our Speaker Series, and marks notable distinctions and awards received by Center Associates. This newsletter serves as a unified vehicle in which to document and distribute news about activities of the Center and its Associates. It also further strengthens the social network ties of the researchers and students involved in the Virtual Center for Supernetworks. We are delighted to announce that the new book, Fragile Networks: Identifying Vulnerabilities and Synergies in an Uncertain World, has arrived. In the above photo we are holding the first of two copies that we, as authors, received. It's always a very exciting moment to see the book that has been worked on for a long, intensive period of time. The feeling is almost like holding a newborn child in one's arms. The official release date, according to the publisher, John Wiley & Sons, was June 2009, and the book is now out, right on schedule! The book is a culmination of several years of research and provides a unified treatment of the vulnerabilities that exist in real-world network systems, along with tools to identify synergies for mergers and acquisitions. The book consists of three parts: Part I focuses on the network fundamentals, efficiency measurement, and vulnerability analysis. Part II discusses applications ranging from transportation networks and supply chains to electric power generation and distribution networks, the Internet, and even financial networks. It also examines the efficiency changes and the associated cost increments after network components are eliminated or partially damaged. Part III provides models and analyses for assessing mergers and acquisitions, network integration, and associated synergies. According to the publisher, Fragile Networks, with its numerous network examples and real-world applications, is an excellent book for courses in network science, transportation science, operations management, and financial networks. It is also a valuable reference for researchers and practitioners in the areas of applied mathematics, computer science, operations research, management science, finance and economics, as well as industrial, systems, and civil engineering. Additional information about the book is available here. My co-author, Dr. Patrick Qiang, just happened to be wearing his Isenberg School of Management t-shirt when our copies arrived on June 17, 2009. Colleagues have commented from as far away as Italy that the cover of the Fragile Networks book looks "stunning." We thank the editors and the publication assistants at Wiley for all of their help during the writing and production of this book! Needless to say, given the deterioration in our critical infrastructure and the opportunities that now are being made possible because of President Obama's stimulus package, the book can assist in wise and appropriate investment decision-making for the nation's (and the world's) network systems. I returned from NYC and the World Science Festival to Amherst in the Pioneer Valley of Western Massachusetts, just in time to help our neighboring town of Hadley, which is still a farming community, to celebrate its 350th anniversary. Hadley was incorporated in 1659! Part of Route 9 was closed for hours (like Broadway now in NYC from 42nd to 47th Street) last Sunday afternoon to allow for the 3 hour parade to take place. The history of Hadley and the anniversary festivities this year are also online. The Pioneer Valley (besides having terrific native produce, which yields such delicious ice creams as "Hadley grass" ice cream, an ice cream made of asparagus and almonds and a seasonal favorite at Cook Farms on Bay Road), also, according to the NYTimes, has one of the highest concentrations of writers in the US. The above photos were taken at the Hadley 350th anniversary parade on Sunday, June 14, 2009, and include the Hopkins School marching band, a classic car, and the Whole Foods (WF) Market shopping cart drill team with some members dressed as fruits. I am back from the World Science Festival (WSF) in NYC, which concluded yesterday with a science street fair. Photos from the numerous events have been posted on flickr. There are also photos from the Traffic panel that I took part in last Friday evening. 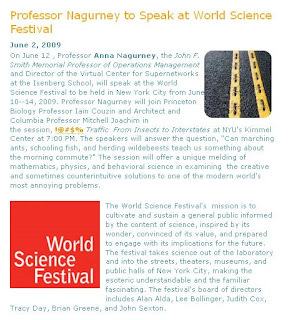 The World Science Festival, which took place June 10-14, 2009, transformed NYC into a science mecca in which scientific research and exploration were recognized and celebrated. The atmosphere at the events, from the gala to yesterday's science fair, can only be described as electric -- the seats were filled at the various panels and events and I believe that many of those that participated will be looking at the world around us in new ways. Megan Talkington, a journalist with Discover magazine, wrote a very nice article on the Traffic panel. Now, it's time to reconnoiter and being on the Traffic panel at the World Science Festival has been the perfect segue for my new book with Patrick Qiang: Fragile Networks: Identifying Vulnerabilities and Synergies in an Uncertain World. Wiley, the book's publisher, has informed us that the book will be "released" this Friday, June 19, with worldwide distribution set for July 2009. Wiley issued a press release on the book in conjunction with my participation in the World Science Festival. The publication of this book is especially timely, given the interest surrounding infrastructure from transportation networks to the Internet and even electric power generation and distribution networks, plus financial networks. Indeed, the New York Times devoted yesterday its entire Sunday magazine to infrastructure. Plus, there have been recent OpEd pieces and major newspapers in the US highlighting the importance of complex networks and infrastructure. Our book provides an original synthesis of infrastructure networks and focuses on unique perspectives and solutions. The beauty and elegance of the book's approaches lie in a systematic analysis of networks, their resilience and robustness, as well as their vulnerability and the associated systemic risk. Fragile Networks identifies how to determine which nodes and links truly matter from economic and engineering perspectives. The book even formalizes mergers and acquisitions in a network framework! The above first two photos were taken Friday, June 12, 2009 in NYC as part of the Traffic panel of the World Science Festival. Joining me on the panel were Robert Krulwich, ABC and NPR journalist, Dr. Iain Couzin of Princeton University plus Dr. Mitchell Joachim of Columbia University. I thought that you would also enjoy seeing a photo of Snowball, the "avian genius," who was also featured at the World Science Festival in a segment yesterday. Thanks to all of you who were in the audience and helped to make the Traffic panel so enjoyable! The World Science Festival concludes today with an all day science fair! Last evening, I took part in the Traffic panel at the World Science Festival at the Kimmel Center at New York University. Robert Krulwich, who has been called the "most inventive reporter," was our panel moderator. I joined him and Iain Couzin and Mitchell Joachim, "Dr. J.," on stage. We had been working earlier on "rehearsing" the segment towards a view of integrating the videos and graphics that we had prepared. Our panel theme was what insects and interstates have in common and how biology, human behavior, and urban design can helps us to "solve" one of the most annoying problems -- that of traffic congestion. Krulwich was fantastic as a moderator and managed to interweave our unique expertises and research into a very entertaining and informative segment. Not only did the panelists have a wonderful time but, based on the questions from the audience and the number that stayed afterwards to continue the discussions, it was clear to me that this panel and the questions that it raised, resonated with the audience. I especially appreciated that the audience ranged from an infant to students from high school and colleges through mathematics professors to interested public to very senior transportation and civil engineering professionals. Even my uncle, who is 89 years old, and an award-winning bridge designer, who still works in Manhattan, came to the event, as did one of my collaborators, Professor Lan Zhao of SUNY Old Westbury, who brought her son and friends. We explored traffic flows from starlings and sardines to ants and locusts plus pedestrian congestion and drivers around the world. We posited "solutions" from enhanced network designs and infrastructure investments, to improved signal settings, to soft-bodied, collapsible cars, some in the shape of sneakers, to sci-fi approaches such as jet packs. I believe that we showed the excitement of the science in the world around us as well as the beauty and elegance of scientific and mathematical approaches to traffic analysis and management. New York City is pulsating with science since the World Science Festival has "taken over the city." The gala that took place at Alice Tully Hall on Wednesday evening was reviewed enthusiastically in yesterday's New York Times. What an incredible event it was and what a terrific beginning to this festival. I thank the founders and directors of the World Science Festival, Dr. Brian Greene of Columbia University, and his wife, the journalist Tracy Day, for having the vision, energy, and creativity to establish this magnificent celebration of science! I also thank the wonderful producers of this festival, with whom I have worked, notably, Alison Snyder and Susan Ades Stone. To experience and be part of this festival with its terrific community of researchers, scientists, artists, dancers, musicians, explorers, and writers, has been incredibly interesting and rewarding. The stay at the Soho Grande, the hotel for the festival, has also been fantastic. I even got a chance to meet other guests at the hotel who are taking part at the festival, including "Snowball," the dancing cockatoo, who is a youtube sensation and who will be taking part in the segment today on avian geniuses. I had an opportunity to talk with Snowball's absolutely delightful and very kind owners and to also "chat" with Snowball. His cage is decorated with all sorts of wonderful toys and his owners told me that he has very much enjoyed staying in NYC! Today I had the pleasure of joining Iain Couzin of Princeton University for the Traffic Jam interview segment of the Brian Lehrer Show in New York City. I especially appreciated how Lehrer interwove our expertise into the interview and conversation. Couzin is a mathematical biologist who researches animal behavior, including herding. He has also studied human pedestrians. The segment was motivated by Mayor Bloomberg's closure of Broadway from 42nd to 47st Streets. Yesterday, we checked out this part of Broadway, which was filled with happy pedestrians. First, I was picked up by a black vehicle in front of my hotel and then driven to the WNYC Studio on Varick Street where the Brian Lehrer Show is broadcast from. I had to present a photo ID to get in and was then escorted to a waiting area. I got to meet another guest that Lehrer was interviewing that morning (about student loans), whose mother, coincidentally, went to the same high school as I did -- Yonkers High! Tomorrow morning we will be rehearsing the Traffic segment for the World Science Festival. It is terrific to see so many banners and posted around NYU publicizing this 5 day festival, which began yesterday evening with a magnificent gala at Alice Tully Hall in Lincoln Center. Our Traffic panel will be at the Kimmel Center at NYU. There is seating for 500 with 100 seats available on the balcony. Today is a very important day for another reason as well. After, literally, months of searching, conducting interviews with finalists, and negotiations, UMass Amherst made the official announcement. Dr. Mark Fuller of Washington State University will be the new Dean of the Isenberg School of Management. He will be holding an endowed chair in honor of our former dean, Dr. Tom O'Brien, who served as our dean for an amazing 19 years! Given the amount of time that the search committee and the UMass Amherst administration spent on this critically important search, we are delighted to have it come to a positive ending. As a member of the ISOM Dean search committee, I thank my wonderful colleagues and fellow search committee members, as well as those who applied for and interviewed for this position. Tonight the World Science Festival in New York City begins with the opening night gala at the newly refurbished/redesigned Alice Tully Hall, Lincoln Center. The gala is to celebrate the opening of the 2009 World Science Festival and to honor Edward O. Wilson, the world-renowned scientist and professor at Harvard University, on his 80th birthday. The lineup for tonight's sold out performance, which I will be attending, includes: Alan Alda, Glenn Close, Marin Alsop, Joshua Bell, Danny Burstein, Christine Baranski, Yo-Yo Ma, Anna Deavere Smith, the National Dance Institute, and the Inspirational Voices of Abyssinian Baptist Church. The gala is directed and produced by Damian Woetzel. The evening will include the New York premiere of Frans Lanting's: "LIFE: A Journey Through Time," a multimedia performance, especially adapted for the World Science Festival. Tomorrow I will be doing a live interview on the Brian Lehrer Show in NYC as part of the Traffic segment, along with Iain Couzin of Princeton University. We are scheduled for 11:25-11:40AM. The interview will be streamed live. Robert Krulwich of ABC News and NPR, a renowned science journalist and reporter, will be moderating the Traffic panel on Friday evening that I am on with Couzin and Mitchell Joachim. The producers of the World Science Festival are also trying to schedule me for another interview during the WSF. Given all the associated special events and programs at this year's festival, we will see if there is sufficient slack to fit another interview in! I am getting ready for the World Science Festival, which takes place in New York City, June 10-14, 2009. There will be a gala to open up the festival this coming Wednesday night and to also honor the 80th birthday of E. O. Wilson, the scientist from Harvard, who needs no introductions. I will be a panelist on the "Traffic" segment that will take place on Friday evening. My co-panelists are Iain Couzin of Princeton University and Mitchell Joachim of Columbia University and the Parsons School of Design. The excitement surrounding the 2009 World Science Festival is palpable! It is an incredible venue in which to celebrate science, creativity, and the world around us! The Isenberg School of Management at UMass Amherst, where I teach and conduct research on networks, is also publicizing the event and has issued a press release. The Traffic segment is especially timely, given Mayor Bloomberg's initiative in closing Broadway from 47th to 42th Street to create pedestrian plazas! Graduations mark milestones in not only the graduating students' lives but also serve as testaments to the families, teachers, friends, and neighbors, who have supported the students. We live in Amherst, Massachusetts, which has been recently selected to be the best college town in North America (beating out such great locations as Berkeley, Cambridge, Washington, DC, and even Montreal)! The beauty in our town is breath-taking and each of the four seasons brings its own uniqueness. Since we are a college town with UMass Amherst, Amherst College, and Hampshire College as the focal educational institutions, and with Smith College and Mount Holyoke College in neighboring towns, education is always valued here (indeed, this sector is the biggest employer). During the glorious months of May and June many graduations take place and it is always a joy to participate in them. I have written recently about the UMass Amherst graduations and festivities at the Isenberg School. Today I am writing about another, truly special, school, The Bement School, from which my daughter graduated yesterday. The Bement School, located in Deerfield, MA, is a K-9 grade school and includes accommodations for boarders in the higher grades. Day students come from several different states and the boarders, who live at the school, which is in historic Deerfield, hail from South Korea, China, Mexico, Singapore, and from across the United States. There have been boarders, in the past, from European countries, as well. The school is a truly special place in which students are nurtured, teachers are respected, individuality is supported, arts and music treasured, and doing one's best and working hard in a community of kindness, recognized. My daughter, along with her 21 9th grade classmates, graduated from Bement yesterday, on a picture perfect day in ceremonies conducted outside. She, with 5 of her classmates, has been at Bement since kindergarten, so yesterday marked a decade of association with this incredible educational institution. I had been appointed the John F. Smith Memorial Professor at the Isenberg School of Management, just before her matriculation at Bement, and purchased a GM Chevy Venture when she started kindergarten ten years ago. This was only appropriate since my chaired professorship was endowed by John "Jack" F. Smith, Jr., a UMass Amherst alum, who was then CEO and Chairman of the Board of General Motors. Well, I am pleased to report, that my Chevy venture is still running great and my daughter is now a Bement graduate. GM has been in the news a lot lately and with its reconfiguration and support by the Obama administration, I hope that it becomes reinvented and a new US manufacturing icon. As for my daughter's classmates, I can only thank them and their parents for their outstanding support, for their unique and special personalities, and for their work ethic and wonderful talents. This class has experienced so much together -- from numerous sports events and musical and theatrical performances, to community service, to dances, to lasting friendships that have been made through shared adventures and trips. The landmark experience, which I wrote about early on in this blog was their trip to the Dominican Republic in January 2009 to help out in "La Suiza," a boy's orphanage. All returned transformed and with a deepened appreciation of their values and the importance of community service, kindness and love. This group of Bementers has been through deaths of parents of several of their classmates and illnesses of their classmates. They have stood together, laughed and cried together, and have become more resilient together. Yesterday, at graduation, they sang together and marched together, while everyone applauded their receipt of their diplomas. I also thank Ms. Shelley Borror Jackson, the Head of Bement, who arrived as head the same time as the 2009 graduating class of Bement. Under her outstanding leadership, Bement has marked a decade of growth with the building of the new Upper School and library, memorable experiences (children learning how to swim, skate, and ski, and to climb mountains), and wonderful education (children learning new languages, world history, advanced math, science, and the love of reading and writing), that we will treasure in our hearts always. Most importantly, Bement lets children grow up at their own pace. Thank you, Bement, for your outstanding teachers, coaches, and staff! If only every child could receive the type of education that you provide! I share some photos with you of Bement Graduation Day, June 5, 2009. Our sincerest sympathies go out to the families and friends of the victims of the Air France plane disaster this past Sunday. The plane was flying from Rio to Paris and all perished in the Atlantic. A 3 mile area in the ocean has now been identified with the plane debris. It will take a long time to identify the cause of the crash. Strangely, this is the second time in 2009 that I have been flying on the same day as a plane crash. Last February, I blogged about my trip to Dallas to give a talk at the INFORMS Chapter. I flew the same day as the plane crash in Buffalo and last Sunday I was flying back from Rome, Italy. The flight back from Rome was very comfortable except that the female in front of me was seriously ill during the landing and the food critic who was seated behind me also was suffering and told me that she is terrified of takeoffs and landings. I remember flying back to Boston from Erice via Milan the morning after the Italians beat the French in the World Cup in soccer in 2006. The festivities following the win in Italy were spectacular with fireworks and much partying. I did not expect the Alitalia crew to be able to fly but fly back to the US we did. However, while taking the shuttle back to Amherst from Logan I had an uneasy feeling and asked the driver whether the tunnel we were going through (a product of the Big Dig) was in good shape. The next morning I read in the paper how only a few hours after my query part of the tunnel roof collapsed and a young woman who was in a car died. The suit was just recently settled. Dr. Arnie Barnett, who is an expert on risk and airplane disasters and is a faculty member at MIT spoke in our INFORMS Speaker Series at UMass Amherst in the Fall 2007. The title of his presentation was "Is it Really Safe to Fly?" I could use a conversation with him now but, luckily, my upcoming speaking engagements I can reach by car and train. This past week I was blogging about the NET2009 conference in Rome, Italy and my travel/transportation experiences. Since, sometimes, a picture may be worth one thousand words, I am posting some photos of Rome, with the proviso that I was not on a Roman holiday but at a conference. I returned yesterday from the NET2009 conference in Rome, Italy. Taking a taxi at 7:00AM on a Sunday to the Rome airport allowed me to experience free flow traffic in that usually very congested city. Rather than an hour trip between these two points as was my experience the previous Tuesday morning during rush hour traffic, the trip took only 20 minutes. There was congestion, however, in the Rome airport where the queues even at that time were sizable due to many departing international flights. Serendipitously, while standing in the line for security I started a conversation with a gentleman next to me who works for American Airlines and had received a PhD in industrial engineering from Purdue University several years back. So, of course, we talked about faculty and students that we both knew. and enjoying the elegance and charm of the people. Thank you, Rome, for an experience unlike any other! PS As for those of you who follow sports, yesterday, the Giro bicycle competition ended in Rome with Menchov the victor.